It’s time for some Cute Outfit Ideas for winter! As you know, my favorite way to wear a sweater this season has been with a lightweight collared button up shirt underneath. This is the second time I’ve paired this Forever 21 shirt with a sweater and I just really love it. It dresses the casual sweater up a bit and gives me that much needed second layer. I didn’t even plan on snapping pictures of me in the outfit, but after I put it on, I just had to share it with you! So needless to say, the pictures were snapped in a hurry. Like…before I took the kids to school kind of hurry. This outfit is so simple and most likely you have everything in your closet to pull it together. All you need is a long sleeve button up shirt with a collar, your favorite winter sweater, jeans, a pair of flats and finish it off with some bling. 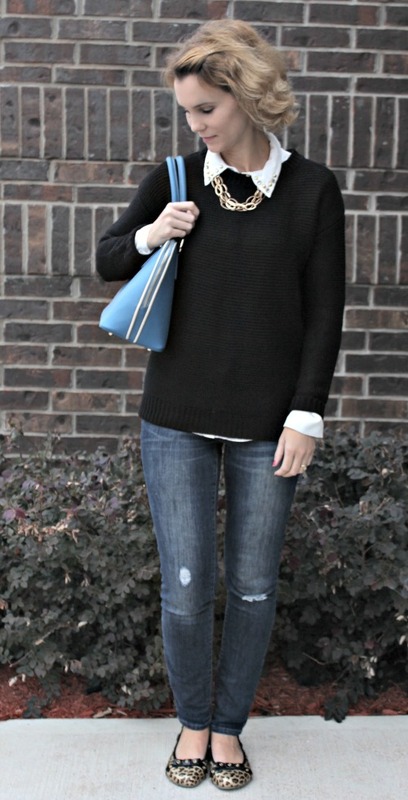 Here are a few more cute outfit ideas featuring my favorite way to wear a sweater.